We are now offering three different classes of prophetic training at our seminar, including our newest class, Prophecy to Destiny! See below for more information. The three classes run simultaneously and are integrated at select times during the seminar. Come join us in an intimate and personal atmosphere with the Lord. Level One: God wants to talk with us and He wants to use your voice. This forum is designed to train all Christians in the fundamentals of the prophetic gifts. We will explore the scriptural importance of prophecy and the impact that the prophetic ministry has on the church and world today. A vital component of the class is to activate everyone in the realm of the prophetic. Level Two: God desires mature men and women who will operate in the prophetic realm with dignity, honor and keen discernment, and who will be prophetic voices that understand the importance and gravity of handling God’s Rhema word. This forum will both engage you and challenge you to explore new levels of your prophetic expression. 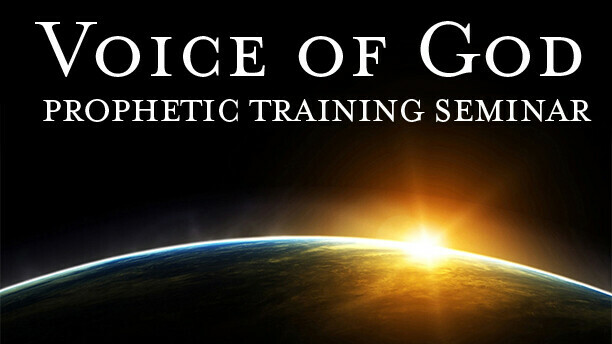 Pre-requisite for this class: Must have attended Voice of God Level 1. Prophecy to Destiny: So you received a prophetic word...now what? What do you need to do to prepare yourself so that you're ready to partner with Holy Spirit in His work? Throughout the weekend, we will be looking intently at your personal prophecies, and will give you tools that will help you discover the hidden treasures of promises and provisions, as well as identify areas of partnership and preparation. A key part of this process is discovering how God really thinks of you and writing an Identity Statement that brings your heart into agreement with the way you are known in heaven. Pre-requisite for this class: Must have attended Voice of God Level 1, must have at least one typed or written personal prophetic word to study throughout the class.